Earlier this week, we talked about how you can make a few simple alterations to your crochet garment patterns to achieve a better fit. Today we share a few tips on choosing the best garment shape or style to flatter your body type. The abundance of patterns available can be mind boggling, but most fall into one of four basic garment styles; set-in sleeves, raglan, drop shoulder, or circular yoke. Each shape has distinctive characteristics that accentuate the body in different ways, and knowing a little bit about their construction will help you choose the style that is best for you. Here are a few characteristics for each garment style. Garments constructed with set-in sleeves are perfect for tailored pullover sweaters, jackets, and cardigans which are body skimming and figure flattering. The raglan sleeve is a favorite choice among garment designers. It can be crocheted seamlessly when worked from the neckline continuing to the body and sleeves, or it can be constructed using more traditional methods, making separate front, back, and sleeves which are later seamed together. Its distinctive shape creates a visual line that begins in the neckline and extends to the underarm. Although currently popular, a garment with raglan sleeves is not always the best choice. The visual line narrows the shoulders and gives the illusion of a larger chest. This style is a good choice for women with larger shoulders and a smaller bust, as it gives a more balanced appearance to the body. That said, you may still find raglan patterns that will look beautiful on any body type – look for garments that have enough pattern to camouflage the seam line making the raglan shaping less noticeable. Raglan shaping is used for all types of garments including sweaters, cardigans, and jackets and look best on women that are proportionally balanced between the shoulders and the chest. 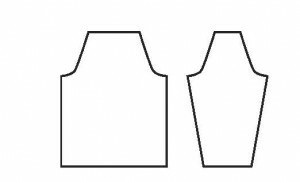 Garments constructed with a drop shoulder sleeve are often rated as “easy to make.” The front and back pieces of the garment typically have no shaping except for the neckline, and the sleeves may have some shaping from wrist to upper arm. A sweater constructed in this style tends to be oversized (at least 4” over chest) as more room is needed to create a comfortable armhole. Because the armhole is deeper there is more bulk between the body and the upper arm which can add visual weight. Also the seam line between the body and the sleeve drops over the natural shoulder falling at the top of the upper arm creating a horizontal line which can visually accentuate the bust. While great for oversized outdoor garments, steer clear of this style if you are looking to create a slimmer silhouette. The casual oversized look of the drop shoulder is a good choice for outdoor sweaters, both pullovers and cardigans. 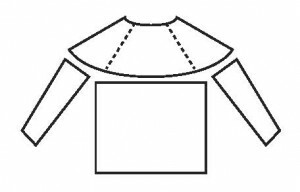 Round yoke garments can be constructed from the top down or begun at the body hem making the sleeves separately, and then joining at the underarm completing the yoke in one piece. The round yoke provides a nice place for design elements which frame the face. This recognizable shaping was popular in the traditional sweaters from Iceland using a heavy bulky wool to create the patterned yoke. You may also see the round yoke used in the construction of baby sweaters too. Round yoke shaping has become a popular design feature for lighter weight indoor sweaters and cardigans. This style looks wonderful on most women, but also works well for women with a larger bust or an hourglass shape. Now that you have a few more tips on how to crochet the most flattering garment for yourself, take a field trip to your favorite clothing store and spend some time trying on different garments to determine which ones look best on you. Better yet, go with a friend and give each other feedback. Afterwards, treat yourself to a latte and some crochet time together! 4 Responses to Fabulous You! Great post, thanks. I will make good use of this information! 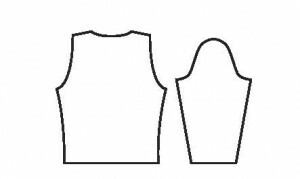 Thank you, for sharing a clearer explantation of sleeve shaping for crochet garments. This is very helpful. I have been trying to understand the garment schematics found in most magazines and patterns and I found this article of great help. I have a jacket I wish to crochet sleeves for. where should I start? 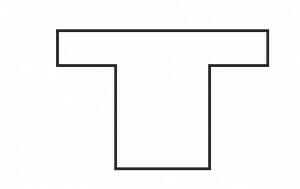 top down to wrist or the other way? Rozee, usually a sleeve is worked from the cuff up. It might help to make a paper template for the sleeve and check your crochet against it as you work.